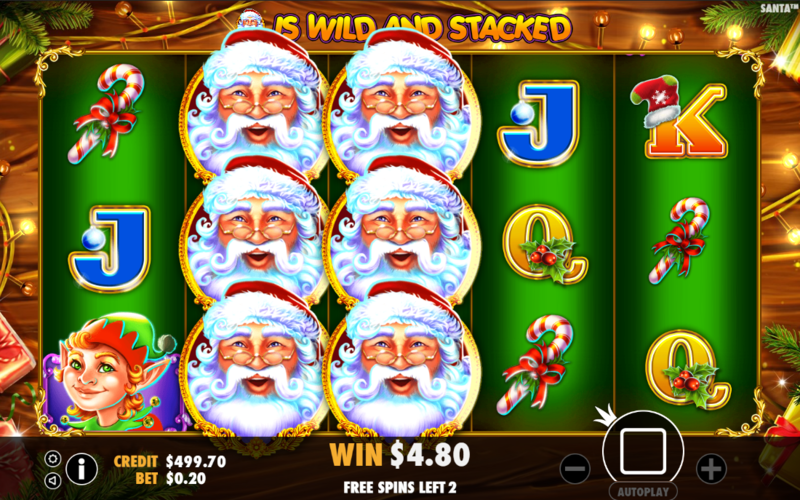 A medium variance slot with an attractive Christmas theme. With two bonus features and four jackpots attached the Santa slot will surely catch your attention. Santa is a video slot coming from Pragmatic Play. This is a medium variance slot which produces small to medium wins on a regular basis, but also has the potential for some bigger payouts in the bonus features. In order to make the slot more appealing to players the designers also added four jackpots with a top prize of 250 times the total stake. 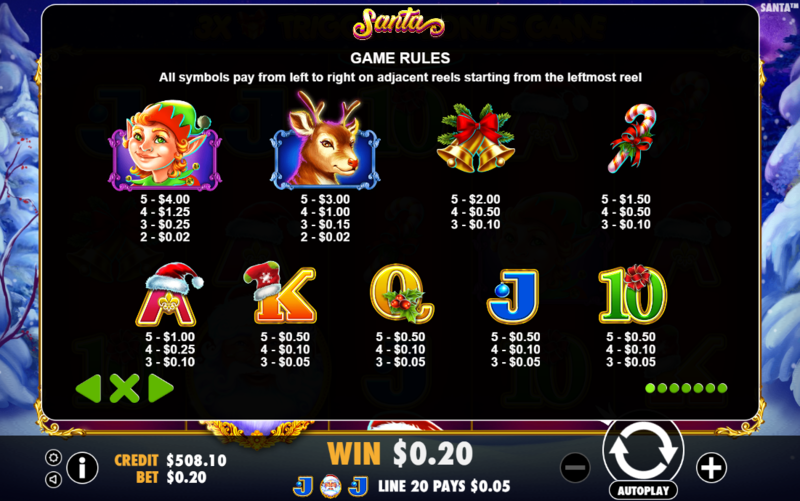 As you already guessed this slot has a Christmas theme with Santa as the main game symbol. The colors in the game are vibrant and cheerful which perfectly fits the game theme. In order to get in the Christmas spirit the designers also added corresponding background music. The slot has an attractive appearance and is sure to catch your attention at first sight. The gameplay in Santa is pretty funny. Thanks to the stacked Wilds on the reels and the medium variance of the game players can expect frequent payouts. As in most other games the biggest excitement can come when one of the two bonus features is triggered. At the same time you have a chance to win one of the four attached jackpots. The bet size in Santa can range anywhere from $0.20 up to $100 per spin. The highest payout in the slot can come from the Elf symbol, since the Wild and Scatter symbols don’t offer any direct payouts. If you manage to land five Elves on a winning payline you will get a payout of 20 times the total stake. 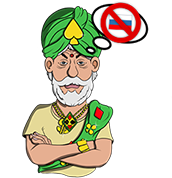 Of course the payouts can be much higher in the free spins bonus with a little help from Santa. The RTP value of the game is set at 95.92%. 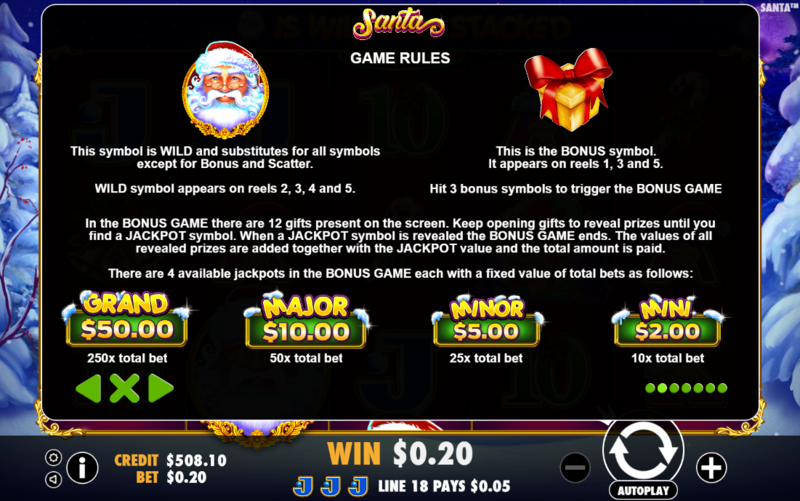 The Wild symbol of the game is Santa and he can land on reels 2, 3, 4 and 5 only. He will substitute for all other symbols in the game, except for the Scatter Christmas Tree and the Bonus Present symbol. The Bonus Present symbol can land on reels 1, 3 and 5 only. When this happens the Bonus Game is triggered where the player will need to open presents from under the Christmas tree. There are 12 presents in total and each one will hold a cash prize or a Jackpot symbol. The bonus round ends when the Jackpot symbol is revealed. Players can win the Mini, Minor, Major or Grand Jackpot which will award a prize of 10, 25, 50 or 250 times the total stake accordingly. The slot also comes with a Free Spins Bonus which is triggered when 3 Scatters land on reels 2, 3 and 4. 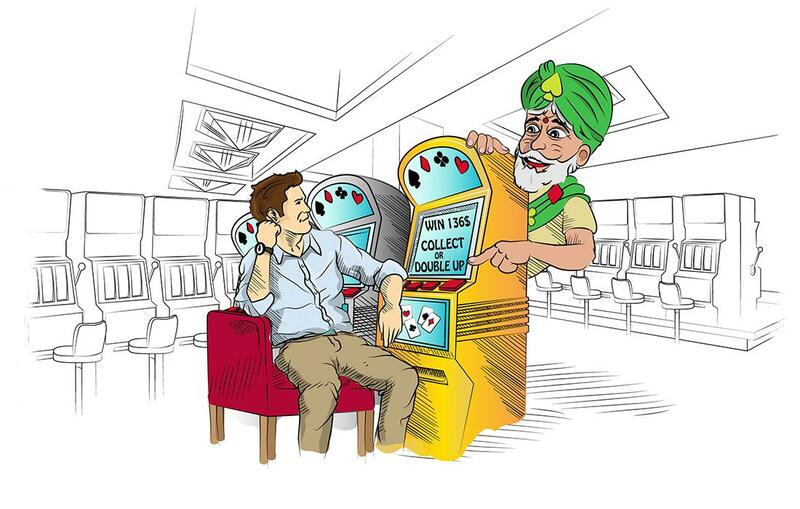 The player is awarded with 6 free spins which unfortunately can’t be re-triggered. During the bonus feature before a spin is completed reels 2, 3, 4 or 5 can become stacked Wild reels. 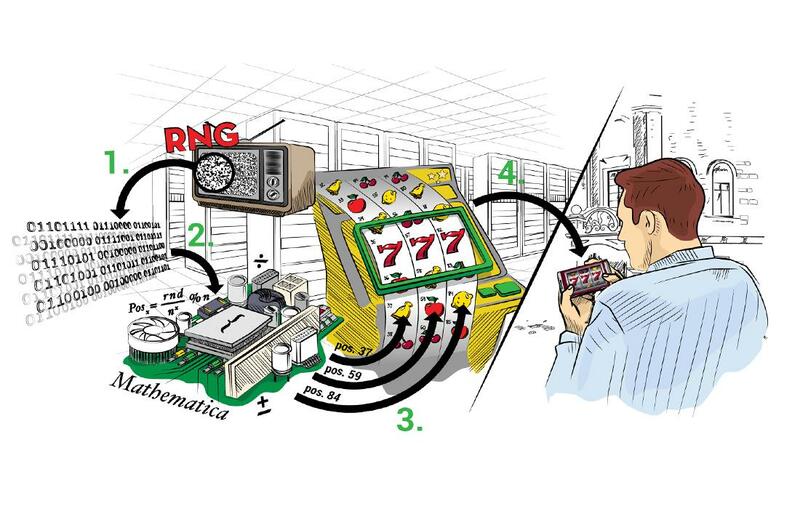 This means that players can get 4 Wild Reels in a single spin, which is a guaranteed big win. 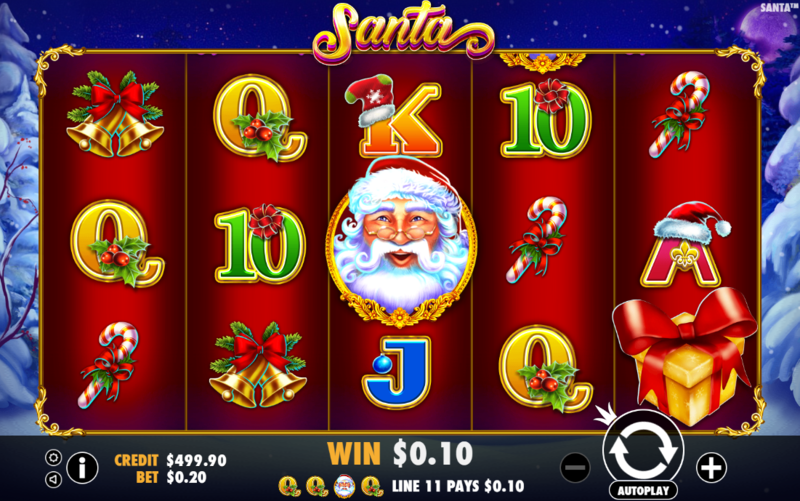 Santa is an interesting video slot which is fun to play. The slot comes with a Christmas theme and a vibrant choice of colors which are pleasing to the eye. With a medium variance and two attractive bonus features the game has the potential for some nice payouts. To top it all off the designers added four Jackpots to the game where players can win up to a maximum of 250 times the total stake.